Posted on November 24, 2016 at 10:40 am. 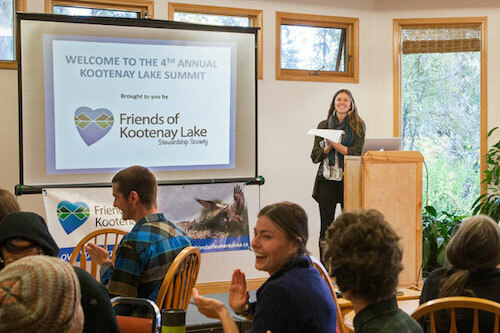 Over a hundred people from around the region gathered at Yasodhara Ashram on October 22nd for the 4th Annual Kootenay Lake Summit, organized by the Friends of Kootenay Lake Stewardship Society (FOKLSS). It was the first time the summit has been held on the East Shore. Participants and presenters included representatives of the Ktunaxa Nation, city planners, environmentalists, wildlife enthusiasts, artists, regional directors, college students and many more. Everyone was brought together through their care for the beautiful Kootenay Lake. “It was wonderful to welcome so many diverse people and organizations standing together and expressing our shared love of Kootenay Lake through action,” said Ashram president Swami Lalitananda. Click to learn more about the Friends of Kootenay Lake Stewardship Society. You can follow Avery’s work as she travels to South Africa as a Canadian youth delegate at a water sustainability conference.